In this workshop, you will go deeply into breathwork practice in order to experience profound relaxation and a release of painful cellular memories. Transformational Breathwork is a simple but effective guided breathing practice done in a reclining position. People have found that a single session can bring about deep physical and emotional shifts and a sense of completeness. Mantra musicians Radharani and CC Treadway will guide the practice with sacred music, drawing you deeper with compelling melodies. 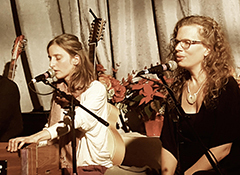 Their evocative voices and harmonies will uplift you and guide you into the heart.